Click the button below to add the SPARKLE MAGIC to your wish list. Bring your marble and terrazzo floors new life and luster. Faded floors will become deep and vivid as when they were new. 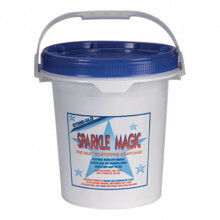 Sparkle Magic polishing powder breaks the bond of ground-in-soil and dulling films, while at the same time polishing the surface of your terrazzo or marble floors to a fine lustrous wet look without acids. Ideal for reviving dull marble, marble agglomerates and terrazzo floors, vanities, tabletops, countertops and walls.